Lots of people use WooCommerce to sell user-specific products. For example, you might want to sell different apparel or merchandise to sports teams or soccer clubs. Maybe you privately sell uniform products to to schools. You might sell branded company workwear with the company’s logo, and need a hidden area of WooCommerce for each customer. Perhaps you sell the same products to each customer, but with different prices. Maybe you’re a health practitioner or service provider, and only sell to existing patients rather than the general public. Whatever your reason for creating WooCommerce user-specific products, I’ll show you how to do it. And the best thing is, it’s really easy and you don’t need to edit any code! Which WooCommerce user-specific products plugin? We’re going to create your user-specific products with our popular WooCommerce Protected Categories plugin. This simple plugin lets you add hidden product categories to any WordPress WooCommerce store. You can have a separate category for each customer, each with their own user-specific items. Your sports teams, clubs, companies or other types of customer will use a simple password to log into their organization’s hidden category. Or if you prefer, you can automatically restrict your user-specific categories so that each one is only visible to a specific logged in user. Once they’ve unlocked their private WooCommerce category, they can view and buy their user-specific products. No one else will even know that their hidden products exist! Start selling hidden WooCommerce products to schools and colleges today. Before you start, you should have a WordPress website set up with the free WooCommerce plugin installed. The official WooCommerce documentation is a good starting point. You can then use this tutorial to create your WooCommerce user-specific products and categories. 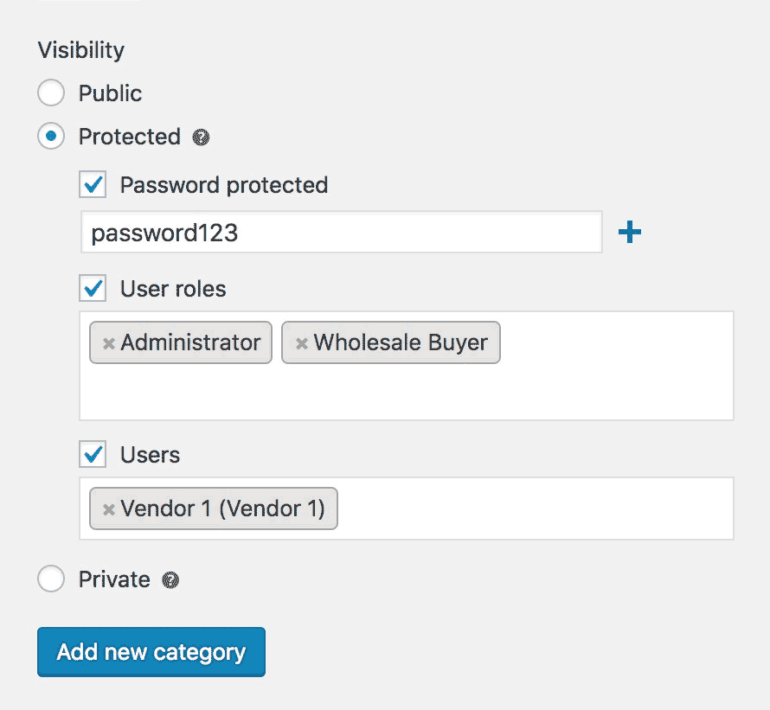 First, get the WooCommerce Protected Categories plugin. You’ll use this to create your hidden customer-specific products. Secondly, install the plugin and enter your license key on the plugin settings page. You’ll find this in the order confirmation email. Also on the plugin settings page, DO NOT tick the boxes to show your protected categories and products in the public parts of your store. 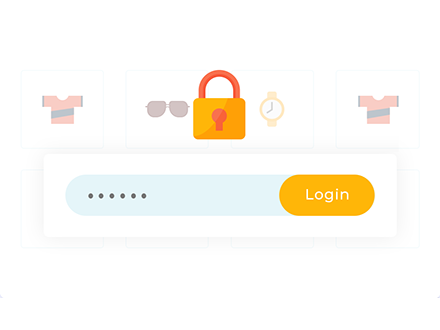 This is important, as your WooCommerce user-specific products should only be visible to sports teams and organizations with the correct password. Next, go to Products -> Categories in the WordPress admin. Create a separate category for each sports club/organization that you wish to sell user-specific products to. Tick ‘Protected’ and either password protect it, or restrict it to a specific user. If you want to provide multiple categories for each organization, then you can do this by adding 1 or more sub-categories. You can create nested structures with as many sub-category levels as you like. As long as you set all the sub-categories to ‘Public’ and select the organization’s main password protected category as the ‘Parent’, all the sub-categories and their products inherit the same protection. Organizations only need to login to their account or enter a password once to unlock their whole hidden area. Now, you can add all the user-specific products. For each one, tick the appropriate product category. Leave the product visibility settings as the default. The plugin will automatically protect them with the same password(s) as the protected category. WooCommerce password protected categories. Add the shortcode [category_login] to any page of your site. All the sports teams/organizations will use this login page to access their user-specific products. The plugin will redirect them to their own personal category when they enter the password. Now, link to this page in any way you like, for example from your navigation menu, website header or footer. Or you can keep the login page hidden and email it to your customers instead. User restricted categories – Add a link to a front end login page. This could be the main WooCommerce ‘Account’ page, which displays a login form to logged out users and guests. Or you could install a front end login plugin such as Theme My Login. Either way, users can use this page to login to their account and unlock their hidden products. Finally, you can instantly redirect customers to their personal WooCommerce store by installing the free Peter’s Login Redirect plugin. This has a handy feature to add a custom redirect URL for each individual user. Simply add the URL of their hidden WooCommerce category. In 7 simple steps, you have created WooCommerce user-specific products and categories. The sports teams or other types of organization will visit your website and access the login page. They will enter the password for their user-specific category, or log into their WordPress user account. They will be redirected to the correct hidden category containing their user-specific products. Each organization’s category and their products are hidden from public view, so only people with the correct access details can see them. This includes hiding them from search engines and other places that people might accidentally find them. Once your customers have found their user-specific products, they can add them to the cart and checkout using the standard WooCommerce checkout. You can use other plugins to add multiple payment gateways, shipping options, and everything else you need to make your store a success. Related: Build a WooCommerce Wholesale Store with Hidden Categories for Each Customer. Before we finish, I’ll tell you about another great plugin for selling WooCommerce customer-specific products. Our bestselling WooCommerce Product Table plugin lists products in a space-saving table view. It’s an ideal layout for user-specific products because you are selling to the same customers on a regular basis. They’re already familiar with your products and would rather order quickly from a one-page WooCommerce order form. They don’t want to scroll through large images and multiple pages of products. The WooCommerce table view lets your customers see all their branded products in one place. They can quickly search, sort and filter the table to find what they want. The multi-select checkboxes make it easy to tick as many products as they need. Finally, they can click a single button to add everything to the cart. WooCommerce Product Table integrates beautifully with WooCommerce Protected Categories. Once the customer has unlocked their user-specific category, their own personal products will appear in the product table. This means that you can create a product table listing all your products, and each customer will only be able to see their own personal products. Neat! What do you need user-specific products for? I hope the advice in this tutorial is useful and helps you to create your own WooCommerce user-specific products and categories. I’d love to know what sorts of organization you sell to that have their own unique products. Do you provided branded apparel to sports teams? Maybe you sell corporate workwear with the company’s logo. Maybe you do something else that I haven’t thought of! Please let me know in the comments.